Love all things racing, and can’t get enough of burning digital rubber on your console and computer at home? Surely you would have a decent steering wheel setup in your living room, and if you are currently on the lookout for an upgrade, might we interest you in what Thrustmaster has to offer with their latest Ferrari F1 Wheel Integral T500? This new racing solution will come with a wheel replica of the Ferrari 150° Italia alongside a pedal set. Not only does it work with the Sony PS3, it will also play nice with the PC as well, boasting the life-size replica steering wheel of the F1 Ferrari 150° Italia that is accompanied by a powerful base that holds the racing wheel’s motor and a pedal set so that you are able to use great hardware to close the gap on the computer’s lap records (or even set new ones if you’re skillful enough). As F1 cars were designed with raw power in mind, so the same kind of thinking is applied to the Ferrari F1 Wheel Integral T500, where it has a built-in industrial-class engine (150 mNm torque, 3000 rpm, 65 W, Ø 52) which is said to deliver impressive force feedback effects. Of course, it cannot simulate the G Forces that bear down on F1 drivers as they tear up a track, but with a wide internal dual belt that offers smoothness and flexibility, you can be sure that the device’s built-in H.E.A.R.T HallEffect AccuRate Technology is able to deliver extreme precision along with a constant, long-lasting 16-bit resolution (65,536 values throughout the wheel’ s steering range). You can set it up in two positions – a suspended position and a floor-mounted position that is ideally suited to F1 racing. Considering the pedal set is made out of pure metal, optimal stability and resistance are ensured. Since all 3 pedals are fully adjustable, it should be able to cater to even the roughest of drivers. 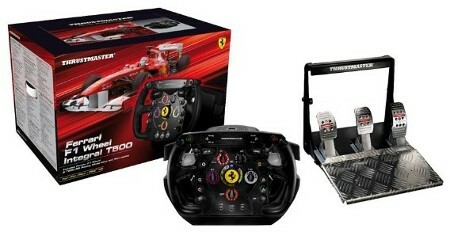 Expect to see the Ferrari F1 Wheel Integral T500 arrive sometime this month for $699.99 a pop. Expensive, yes, but at least it is far cheaper than buying your own F1 team!